After last night's long stay in the library, my classmate Lauren Wright and I bonded over being Boston outcasts here in L.A. We also sit next to each other in our Constitutional Law class, and this morning she surprised me with a tasty treat: two SoyJoy bars. 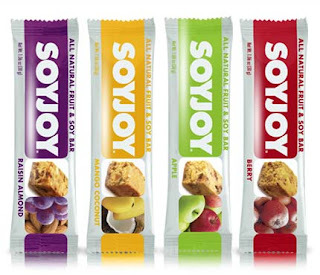 I've never tried SoyJoy before because, frankly, they always seemed gross to me. I can't aritculate a particular reason, but among the plentiful options of fruit bars they never particularly appealed to me. Well, thanks to a care package from Mama Wright, Lauren has changed my mind. Mama W sent Lauren a care package full of SoyJoys and, after noticing they are gluten free, brought me two SoyJoy bars for me to try. I just ate the Mango Coconut bar that she gave me, and I am now a changed man. I loved it! It is a nice light snack, delicious, and free of gluten. There are 6 flavors, all gluten free! Now I can't wait to eat the Raisin Almond one...thanks Lauren and Mama Wright! March is National Peanut Month! Link between Autism and Celiac?